was Santa upon one knee. I listened closely to what he’d say. 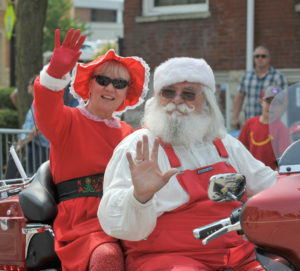 I am honored to work with the real Santa and Mrs. Claus year after year! Thank you for all you do for us. 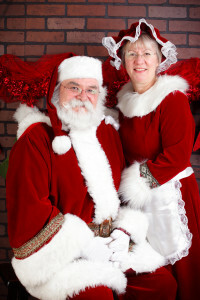 It’s my absolute pleasure to recommend Robert and Carol Hildreth to portray Santa and Mrs. Claus at your next event. I have known the Hildreth’s for four years now and I have thoroughly enjoyed my time working with them. They have portrayed Santa and Mrs. Claus at our annual Breakfast with Santa and Polar express events, as well as participating in our July 4th parade. When you think of the traditional Santa and Mrs. Claus, you imagine jolly, friendly, smiling people who bring joy to all around them. In addition to Roberts’s natural beard and Santa-like presence, and Carol’s bright personality, they both fully embody these characteristics. They have helped take our events to a new level and have been an absolute pleasure to work with. 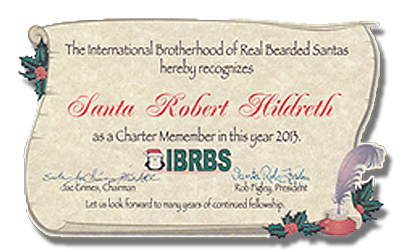 Without a doubt I confidently recommend Robert and Carol, as Santa and Mrs. Claus, to join your next event. I know they will be a wonderful addition and asset to your organization. Please feel free to contact me at should you like to discuss the Hildreths’ qualifications and experience further. I’d be happy to expand on my recommendation. Santa and Mrs. Claus have been visiting the kids here at Shriners Hospitals for Children – Chicago for the last few years. We get so excited for their visit. They make sure all the kids are seen in our outpatient clinic to our Pediatric Intensive Care Unit. Santa and Mrs. Claus are the real deal. Santa is so patient and takes the time to listen to the kids share their stories and what they wish for Christmas. He has a way to communicating with our patients no matter their background, their age, or their interests. He can spontaneously have a conversation with ease and can even answer their questions about the elf on a shelf. Santa has a myriad of knowledge as he has proven he can relate to any child at any age. When you look at Santa, you believe. The authenticity is remarkable. The kids AND adults stand in amazement and take a double take as if they are saying to themselves “Do you see what I see”? As a children’s hospital we get many characters visit during the holidays. Many of our teen patients are not interested in approaching them at all. THIS Santa however is different and ALL of our patients whether 2 or 21 enjoy talking with him and invite them in. He has the ability to touch the hearts of so many with his warmth and caring nature. I highly recommend Robert for your holiday events. He is authentic and has a heart of gold. You will not be disappointed. I have worked with Bob and Carol now for about 5 years. Our relationship started out with portraits of them, Santa headshots, and quickly moved to working together on many projects as Santa. From small quaint occasions to all out hundreds of people waiting in line. Each time I am impressed with him. I hear that time and time again from different clients we’ve worked with as well. No matter the crowd he makes it seem like you’ve known him for years. Children aside, he knows how to handle adults as well, which is very important. When it comes with dealing with children is where Bob shines the most. Yes, he makes an outstanding looking Santa but his skills with the kids is where he really shines. He makes each one feel special, even in a group setting. He talks with them, laughs with them, he listens to them. Bob and Carol are very professional and both love kids dearly, they know how to care for them, and how to manage them as well. I would recommend Bob in a heartbeat, I love working with them. real hair, real mustache, and a very sophisticated and magnificent Santa suit. They stand in amazement and just stare for a few minutes before they finally approach. The children warm up to Bob in a special way. He has the ability to focus on each individual with warmth and care responding spontaneously to their requests and concerns. These excellent people skills along with his striking appearance have set him apart from the run of the mill Santa. His appearance is eloquent and classic. I highly recommend Bob for any occasion or activity where a Santa is needed. He will exceed any expectations you may have for the event. It will be a magical wonderful experience for all. We want to thank you for making our family Christmas celebration so special again this year. As we gather on Christmas Eve, your visit is a highlight. 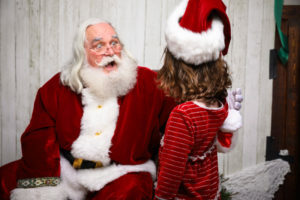 Our younger grandchildren are convinced that you are really Santa and they are so excited to have you with us. When we look at the pictures and see their faces again, it gives us so much joy. The older ones believe in Christmas magic again when you arrive and they really enjoy watching their little cousins interact with you. The adults also look forward to seeing the joy of Christmas that Santa can bring amid remembering the birth of Jesus so many years ago. We all become kids again for a brief moment. We hope that we can look forward to more visits from Santa and Mrs. Claus in the future and we wish you a very Happy New Year.